In a customized watch safe, your most valuable timepieces are not only safe from wrongful access but also thoroughly protected against environmental influences. Exterior and interior are planned and manufactured down to the smallest detail, entirely to your wishes and needs, in the materials and colours of your choice – the unique looks of the safe does right to its valuable contents. A HARTMANN watch safe is more than just a protected deposit space – it is a symbol of your exceptional taste, reflecting a long tradition of exquisite craftsmanship. Have your watch safe equipped with the requested number of watch winders of your choice. They can also be fitted as a removable module. Even during storage in the safe, watch winders ensure that your self-winding watches remain fully functional and are always available for display. Time and date settings are always accurate. If you like to wear different watches from your collection to suit the occasion, this is especially important. If you possess special models, such as aviator watches that display the phases of the moon, or vintage watches with a continuous calendar, a watch winder is especially useful. A watch winder is also and effective measure of preventing oil in self-winding watches from becoming adhesive. In addition, watch winders are viewed as an exceptionally stylish setting to store watches, as they allow a watch to be presented to full advantage. The composition of your watch collection decides the choice of watch winders, the number of winders needed to correspond with the type of watches you own and the size of your safe. 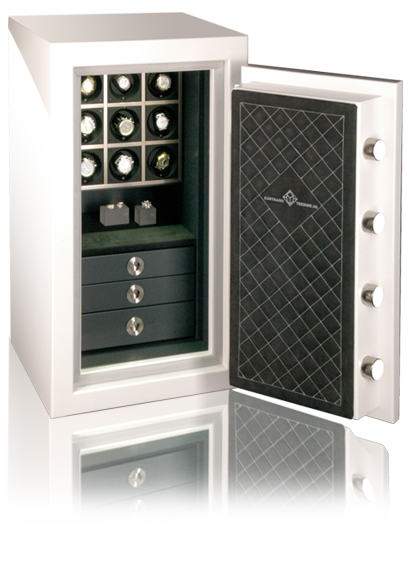 To suit your watch winder demands we accustom the interior of the safe. Large, heavy watches need powerful winders, and according to the watch model it must be available to change the setting of the winders; watch winders must further be able to move at different speeds and in different directions. For more watches or other pieces of jewellery the drawers provide space with specially equipped interiors. Usually constructed from finest hardwood every drawer in your watch safe is fitted entirely to your wishes, down to the smallest detail. It is left to your own individual desires to choose between walnut, oak, maple, cherry or another type of wood. The drawers can be lined with velvet, Alcantara or leather in any colour you decide to choose. The drawers of your safe can be equipped with watch cushions or watch chambers if you wish, but also special chambers for storing other jewellery, such as rings, cuff links, necklaces or bracelets. Certainly, delicate glass shelves can also finesse the interior, and LED lighting will present your valuables to the best possible effect. Your personal wishes also decide the exterior colour scheme – if you prefer a notable, high-gloss black finish, chic white, an exclusive shade of gold, or even Ferrari red, Lamborghini orange or a delicate rosé. Of course, your watch safe also offers enough secure storage space for other pieces of valuables besides watches and jewellery, such as important documents, certificates etc. The form and finish of the handles and fittings can also be decided by you. Gold, nickel or platinum plating – the choice is yours! Beauty and security go hand in hand! Security is one thing you don’t need to worry about with your watch safe. We offer you more than just a safe, we supply a complete security package and work closely with you to guarantee your watch safe is joined in the security systems of your home. HARTMANN safes are tested and certified to European standard EN 1143-1 and are accessible in all burglary protection categories. Which security level is the right one for your watch safe is decided by the value of your watch collection. You can expect us to give extensive, thoughtful advice to provide your valuable collection with the best possible protection! Furthermore, there are many lock options to choose from. Contact us for advice on which locking system is suitable for your watch safe. An electronic locking system or innovative fingerprint locking system provide you with a crucial advantage over a classic double-bit key lock: where there is no key, there is no need to worry about keeping it safe. If required, your watch safe can also be equipped with burglar alarm system components. To raise your insurance cover more, you can connect your safe to a VdS-approved burglar alarm system. Who could you ask for more security? Certainly, our expert staff will also take care of the efficient delivery, installation and anchoring of your watch safe at its chosen location. In this area, you can rely completely on our all-round service. We will be willing to answer any questions about your safe long after you have purchased it, as part of our after-sales service. HARTMANN TRESORE AG is one of the largest suppliers of quality safes in Germany, Europe and the Middle East. In 1983, the company began to specialise in the production of safes on the solid basis of around 150 years of experience in the locksmith’s craft. The brand “Signature Safes by HARTMANN” is top of the range providing unique, original designs for connoisseurs and watch and jewellery collectors to match both your collection and your personality. What will your uniquely personal watch safe look like? How will it be furnished? Should it be the centre of a specific room? Or do you not have a definite idea of your safe yet? Do you have detailed plans to enlarge your collection soon? Whatever the case, we will be pleased to advise you and clarify any issues to assure that your safe is exactly right for your present or future collection – your entirely personal watch safe! In a custom-built safe which is approved and certified and designed solely to your specifications and requirements your valuable collection will be kept with the best possible protection. A unique safe that is a mirror of your personality and expression of your lifestyle! What will your personalized watch safe look like? How will it be furnished? Possibly our gallery will provide you with some inspiration. We will be pleased to advise you individually and guide you on the design for you Signature Safe. We will design your watch safe according to your needs and specifications – from the exterior paintwork to the smallest interior detail! You can count on HARTMANN quality! In conformance with valid European standards, our watch safes have been tested and certified by equitable institutions. Security is our top priority! Optimum protection for your collection! With the requested amount of watch winders of your choice and specially fitted drawers.